The XE100 checkweigher is perfect for use in logistics and end-of-line packaging applications, where strict demands are placed on accuracy and ease of operation. Performance and value, combined with a wide array of package handling, production monitoring, control and communications options, make the XE100 optimally suited to checkweighing applications in virtually all sectors of industry. The 7" color touchscreen user interface has a very intuitive and easy to use multilingual icon-based menu system with unlimited user profiles. This makes product setup and changeover procedures both fast and efficient, thereby minimizing downtime and operator training requirements. The simple design with fewer moving parts and standard cable connections allows for easy access to all components and for simple connection to up and downstream equipment, making this checkweigher simple and quick to service, install and run. Reduces downtime and saves money. All production data and statistical information can be made available in real-time within your local network. Production and quality managers can access and review all relevant data from their desks. Enables rapid response to problems and facilitates preventive measures, thereby minimizing downtime. Protect your investment with this high quality, stable and extremely reliable rugged design. Less failure, less downtime, more profit. 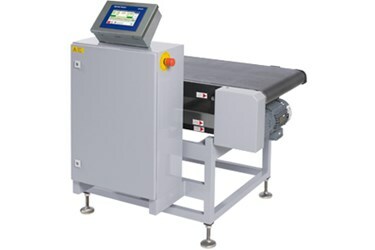 Continuously variable conveyor speeds with constant torque ensure exact speed regulation and package control. Eliminates costly package timing and spacing errors. 100 product setups. Simple operation and user profiles, various dialogue languages. Password protection. Bright, high-contrast color touchscreen TFT display, 7" widescreen with 800 x 480 px. Comprehensive display of current weight data and overall production results.